The Bankruptcy Code puts specific demands upon the debtor seeking to eliminate debt through a bankruptcy filing. It is important for clients to realize that these demands are inherent in the bankruptcy code and are not needless demands from their bankruptcy attorney. In many cases, debtors will wrongfully assume that the demand is coming from their attorney. It is important to shift this way of thinking so that the client realizes that the attorney is simply trying to have the debtor fill the requirements of the bankruptcy code. prior to filing and it is good for 180 days and then it expires. Importantly, if the debtor takes the credit counseling session, he or she should be prepared to file the actual bankruptcy case within the next 180 days. If not, the individual or couple will have to submit to another credit counseling session because their first session certificate will have expired. It is important for the client to understand that this session is required under the bankruptcy code and that anyone filing bankruptcy throughout the United States must complete this session. It is not a burden that the debtor’s counsel is putting on the debtor. It is a burden that is mandated by United States Bankruptcy Code and is required of every single person filing for bankruptcy. matches their current records. This means that the address used in the request must match the address listed on the return. Many debtors move around quite often and it is very easy to submit an authorization which does not match with the records of the IRS. Clients need to understand that this requirement is necessary to have a completed case. By that I mean, you can file a case without the federal tax returns. However, if they are not submitted within 46 days of filing, then the case is automatically dismissed by the clerk of the bankruptcy court. For that reason, many bankruptcy attorneys will require the production of those tax returns prior to filing. This is an honest safeguard against filing a case and then having it dismissed for failure to provide tax returns. It is better to have all the items upfront to ensure a smooth bankruptcy proceeding. The attorney should explain this predicament to the client so that it is understood that the production of the tax returns are necessary to prevent the automatic dismissal by the clerk of the bankruptcy court. It is not the bankruptcy attorney trying to be difficult. Rather, it is the bankruptcy attorney trying to ensure that a filed case doesn’t wind up being dismissed. The last major requirement is the production of the most recent two months’ worth of pay advices. Pay advices can take the form of paychecks, Social Security awards, disability payments, unemployment benefits as well as any other source of income which must be documented. 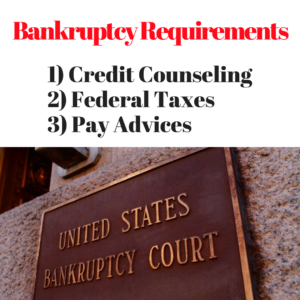 This is another situation where the bankruptcy attorney needs to explain to the client that this requirement is not the law firm’s requirement, rather, it is the requirement of the United States Bankruptcy Code. If the pay advices are not provided, then they cannot be forwarded to the chapter 7 or Chapter 13 trustee as required by code. If the trustees do not receive the pay advices, they will not examine the debtor at the required meeting. If the meeting is not heard, the case will dismiss. As above, the bankruptcy attorney is trying to prevent a filed case from being dismissed. Although this may seem burdensome and difficult to some debtors, they need to be advised that the request is necessary based upon the bankruptcy code and not based upon some burdensome request of the law firm. By softening the existence of these requirements and by explaining to the client that these are bankruptcy code requirements, not the law firm requirements, the debtor and the attorney will be in complete understanding with regard to these items. Many firms state “we can’t file your case. You haven’t given us X, Y or Z.” It is extremely important for law firms to communicate with the client to the extent and to the effect that the case cannot be filed because specific items required of the bankruptcy clerk and under the bankruptcy code have not been provided. It is important to show the client that you are working hard on their behalf and that you wish nothing more than a smooth, helpful bankruptcy experience. By communicating in the proper way and by using proper wording, you can shift the debtor’s thinking. Instead of thinking that you are making these demands, the client will understand that you are trying to assist them in the demands put on them by the bankruptcy code.